The All Terrain Vehicle (ATV) Mod for Minecraft allows you to build and use three different "tiers" of ATV. Zooming the countryside without regard for staying on the roads and watching the land whip swiftly past you will make it fun to cruise from one end of your Minecraft world to the other. Tier One ATVs are grey, Tier Two yellow, and Tier Three aquamarine. The higher tiers are faster and more powerful, but all three ATVs are strong and durable. You can easily mount and dismount your vehicle and will be given a driver’s seat view of the screen before you. As you speed off over the terrain, you will hear a more or less realistic vroom-vroom sound from your engine. The bigger the engine, the bigger the boom, the faster it speeds along, and more power you will feel under your seat. These all-terrain vehicles easily take you up and down hillsides, over shallow water, and through grassy fields. 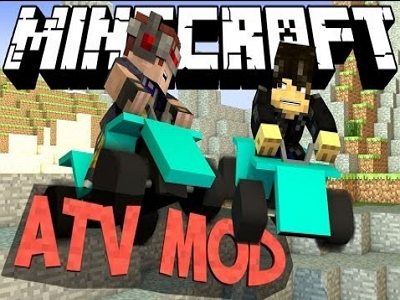 The ATV Mod for Minecraft helps you get around and does it in style.